Well, hello there! It’s been a while, hasn’t it? For all intents and purposes, I stopped blogging in the fall of 2013, after I posted the book tour details for The Impossible Knife of Memory. I didn’t talk about it too much, but that was when my father took a turn for the worse. He had enjoyed ridiculously robust health, but suddenly he suffered some strokes and started having terrifying delusions. In March of 2014, he fell and hit his head, and died two days later. To say that I was devastated doesn’t begin to describe my state of mind. My father was my hero; a WWII veteran who became a minister, marched for Civil Rights and faced down the Klan, wrote poetry, raged at injustice, and tried to make the world a better place. He was also plagued by PTSD, depression, and alcoholism. When I was a kid, I adored him. As a teen I was afraid of him, angry, and terrified he was going to kill himself. After I left for college we entered the Cold War phase of our relationship. One of the most delightful aspects of my adult life was moving my parents back North from Florida so we could take care of them. 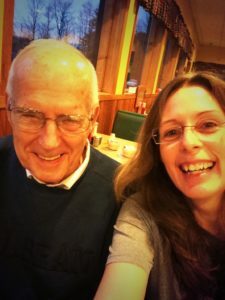 I went to the gym and then breakfast with him a couple days a week, talked with him constantly, and basked in the good fortune that we had so much time together. When he died, I needed to withdraw a bit. Blogging did not happen and updating my website was not a priority. We tried to get on with the business of living. Our children started to have children. We hosted my oldest daughter’s wedding at our house. I finally finished Ashes, and went on adventures to China, Europe, Australia and New Zealand. I tried to write and threw out a lot of horrible pages. But I finally learned how to walk with my father in my heart. So I’m back. My website has been rebuilt from scratch thanks to my wonderful assistant, Jenn, and Deena Warner. I have a lot of fun travel coming up, am working on several new books, and have Many Big Thoughts that require blogging again. Do you have specific topics you’d like to see me blog about? Writing advice? American history? How to live out of a carry-on during book tour? Put your ideas in the Comments, or reach out to me on social media and I’ll see what I can do. Thanks for your patience, my friends! Unveiling new Mad Woman in the Forest website!! I’ve mentioned the website overhaul that we’ve been working on in the Forest for a while now. While the old site was very pretty, we had a lot of complaints about the Flash and navigation issues that gave me migraines. Enough of the new site is up and running that we can unveil this, the beta version, for your critique, and possibly, your delight. Obviously, we have a lot of content to be added, particularly for teachers and students. Our goal is to get all those pages up and running by the time school is back in session. But really, you should visit the site itself and stroll around a bit. Web God Theo Black has finished the major website overhaul at my website, Writerlady.com! Yes, there are nit-picky things to clean up, and yes, there are still a few things to be added, including a page to tell you how to get signed copies of my books, but we’re getting there. If you get stuck in the branches of the tree (still a glitch there) use the words at the bottom of the page to navigate. What do you think of this new version of the site? Anything not working for you? This medicine the doc gave me is amazing. I am already feeling much better. Sad, though, about the death of Arthur C. Clarke, whose books, along with Heinlein’s, helped me survive high school. Clarke lived to be 90 years old. I can’t begrudge him getting tired after a while. I am putting the finishing touches on some stuff for the long overdue website overhaul. I need your help. One page is just my Favorites: food, season, city, etc. What do you want to know? Also, I am finally doing the FAQ. What Frequently Asked Questions do you want answered? What Infrequently Asked Questions? Teachers – I think you should give extra points to any of your students who pose good questions here! Did you read CATALYST or PROM? Theo is putting the finishing touches on the playlist section of my Writerlady website overhaul. We’ve got plenty of songs for the other novels (special thanks to handworn and to John Connolly and his students for all their help). We are a little light on the number of songs suggested for PROM and CATALYST. And I am on deadline. And after that, I have another book to write. And one of my kids finally comes home on break today. So I could really use your help. Any suggestions? What songs tie into the main characters and situations of PROM and CATALYST? Teachers! If your students help out with this, I promise a hand-written thank you note!